Unique services that integrate our comprehensive global database and technological expertise, including tattoo research for Thoroughbred identification, customized reports and catalogue updates. 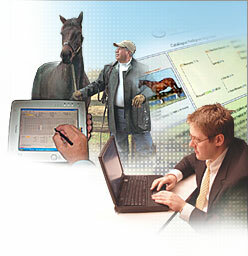 The Jockey Club Information Systems, Inc. (TJCIS) is a unique and diversified organization that provides instant access to information and expertise to aid decision-making and improve Thoroughbred management and promotion. TJCIS is a wholly owned subsidiary of The Jockey Club and reinvests all profits in the Thoroughbred industry. It also owns a majority interest in Blood-Horse magazine.